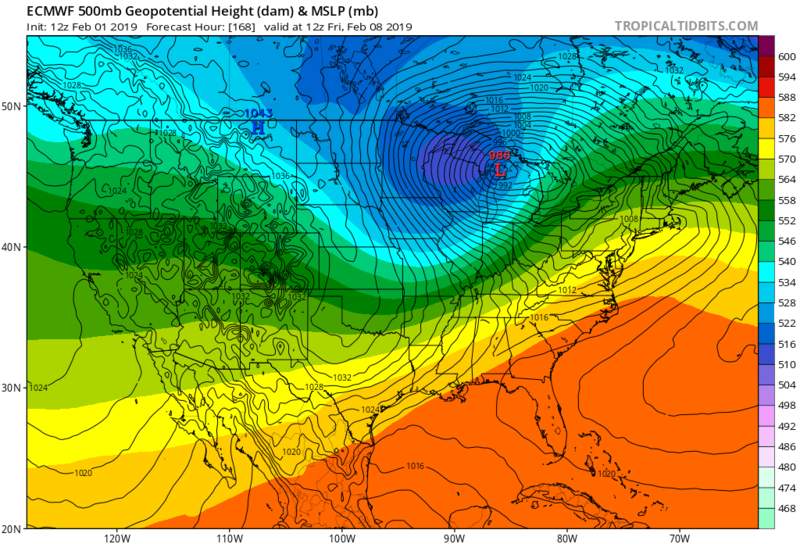 A couple weather systems toward the end of next week are going to bring warmth and moisture far enough north that it may create some thunderstorms to the lower Midwest/OV which just saw temps from -10 to -30 degrees yesterday. Euro is showing a likely severe thunderstorm outbreak and has been for the past 3 or 4 runs. 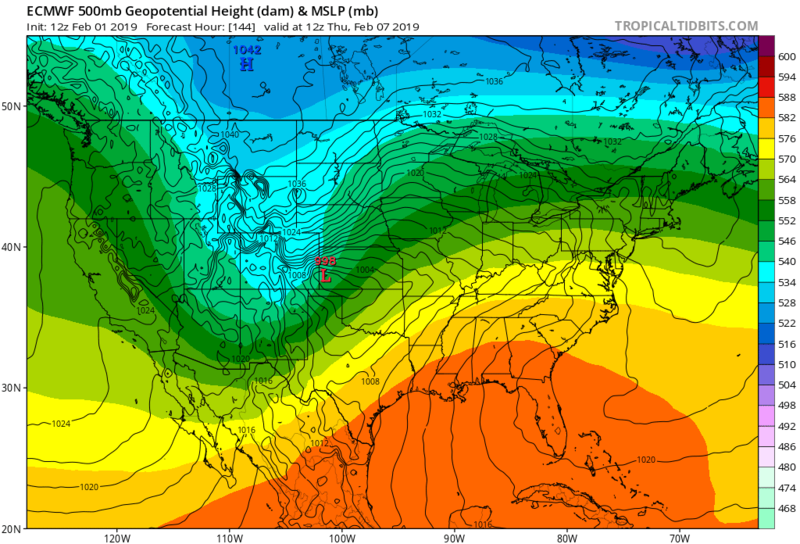 Latest Euro has upper 50/lower 60 dew points up to central Illinois (~600-1000 j/kg CAPE), southerly or south-southwesterly surface winds, moderate southwesterly 850mb winds, and strong west-southwesterly 500mb winds. CAPE and the LLJ are a bit weaker than you'd need for a tornado outbreak, but these may trend upwards and may still produce some interesting severe weather regardless. This solution has been slower and further north than GFS, but GFS has been inching toward Euro's solution for the past 2 days now. Unsurprisingly, GFS has quite a bit weaker moisture and instability than Euro. I don't usually put much stock in GFS for those factors... I'm more looking at the positioning of the low/shortwave. Just like GFS, Euro slowed it down significantly. It doesn't look nearly as impressive as 12 hours ago... but with ~60 degree dew points in SW OH and very strong winds approaching the area (55 knots at 850mb, 80+ at 500mb), I'm sure it'd be interesting. I'm not gonna lie, I'm looking forward to this February thaw. Our streets have looked like mirrors ever since that last storm on Monday that gave us an inch or 2 then the rain on top, then the flash freeze and the snow getting flattened to smooth icy finish.... then the polar plunge. Kids haven't had school for a week because of the side roads. No way buses could get around. Neighbor kids have been skating in the street and the ice is so think they're doing power stops kicking up snow spray. It appears 00z GFS began a trend of the Arctic high/jet backing off, allowing for the warm front/ridge to go further north. Any similarities to Dec 1st? Not sure about cycle timing etc., but had just come off a cold and snowy November and it wasn't looking anything like what it ended up being. Not calling for that by any means, but just wondering if you see any similarities. Well the models are completely lost right now with GFS showing a weak, suppressed wave and Euro showing the complete opposite. If we assume Euro is right, then there may be some similarities but one key difference between 12z Euro and 12/1 is that 12/1 had blocking to its north which is why the low and trough didn't depart much from the warm sector as it occluded. 12z Euro is showing no blocking to its north, so the low would rapidly spin away from the warm sector... as you'd expect in an occlusion. That's just from looking at the surface and 500mb. Another part of what made 12/1 was the lapse rates due to the trough sitting over the Midwest. It was a complicated situation because usually vertically stacked systems are just cold throughout the column, but there was a southerly LLJ outside of the warm sector that was able to create a sort of secondary warm sector which warmed the low-levels. That, combined with the typical southeasterly winds around the southeasterly quadrant of an occluded low, also made the low-level wind shear what it was. where a potential area of interest for severe remains difficult. remain nebulous at this time given the model variability. Under WWA and could possibly be upgraded to an ice storm warning. .25-.50 ice accretion for tomorrow night. Might have a low-topped squall in the OV. This is a GFS sounding just west of Cincinnati. Definitely enough to make a non-zero severe threat... hell, maybe even some thunder. Low tornado threat here. NAM's more on the extreme side with better instability and more backed surface wind (more easterly/less westerly). This screams low-topped (HSLC) squall. Cincinnati drops from 62 degrees/61 degree dew point to 45 degrees/39 dew point in 3 hours. I'm ready to hear some thunder. Storms should be on-and-off through the night due to WAA. Have some strong convection in SW IN... wouldn't be surprised if there's some small hail with that activity and anything that forms behind it because of increasing lapse rates/elevated instability. 00z soundings are revealing... ILN sounding has some elevated instability up to about 680mb then a slight inversion above that. The SGF sounding (upstream of ILN) shows the opposite; a stronger inversion below the beginning of the EML and better lapse rates above it. This tells you the EML is trying to make its way northeast into the OV which is increasing elevated instability... but you can see in the ILN sounding that the EML hasn't fully arrived and/or has modified. Pouring frz rain here. Lightning and thunder with it. Rates maybe too high to accrue as much ice though. Had some thunder a bit ago. Quite a bit of thunder and lightning in the last 15 minutes. Winds were a bit gusty...heavy downpour...nothing too crazy, but definitely priming the area for the flood event. Wow, that's some good ice accretion. At least 0.25" would you say? We ended up with plain 'ole rain at about 34°F, complete with lots of thunder and lightning. I'm ready for spring if this is how the rest of winter is going to go. I would say around .25-.30. Think we still have a couple of decent snows left before spring.